Why make it easy for winter’s little hazards to get the better of your plants or crops when you can easily keep them at bay with trestle staging? During the sowing season, a working-height table takes all that back-breaking bending and kneeling out of the task. But that very same staging is also seriously useful for storing crops like onions, where air can circulate, preventing mould and fungus. 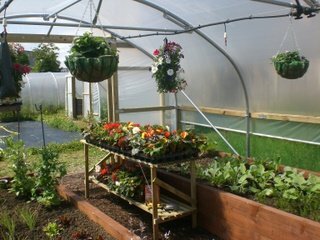 Assembled in seconds with no screws this Polytunnel/Greenhouse staging is perfect for keeping compost, fertilisers or tender plants off the ground, reducing the risks posed by winter’s extremes of cold or damp. Watch a video of our staging. Bubblewrap your Polytunnel for Winter. Greenhouse or Polytunnel. Which is best? The facts! Previous Post The Ultimate Guide to Drying Herbs at Home Next Post Polytunnels – The Movie! Also folds away for easy storage. I’ve just used my trestle staging at my daughters birthday party. (After cleaning it down of course). Perfect for butties and jelly – Worked a treat 🙂 It’s back in the polytunnel now.